GG V will be largely an educational mission to the islands, and there will be but three of us leaving in about two weeks time; that is, if we can get visas! At time of writing, the Embassy of São Tomé and Príncipe in Washington DC appears to be closed, and no one seems to know when it will open; assuming that it does and that things work out, we arrive in São Tomé on April 15th. During GG IV, I showed lots of islanders a powerpoint series of ideas for posters illustrating the islands’ unique biodiversity. Everyone seemed excited about the idea. What better way to inform the citizens of the uniqueness of their islands than through beautiful pictures? Showing poster powerpoint to Carlos Pinhiero and Daniel Ramos, Director of Principe National park. Principe airport. T. Daniel phot, GG IV. Below is a finished product; we now have 200 of them of two different sizes and with five different messages, and we hope to deliver them to all of the schools and offices on both islands. When I first put the powerpoint presentation together, I thought that if the islanders liked them, producing the posters would be easy. Nothing could be further from the truth, and it took an entire year. I need to thank all of the folks involved. The idea for the posters came out of the realization that we had two strengths nobody else had: (1) we were the only academic institution doing ongoing research on the islands (discovering new species, etc. ); we had the latest information and we could identify what we were looking at and (2), we had hundreds of high quality images – not just typical tourist images of the gorgeous beaches and forests or the fantastic phonolite towers like Cão Grande, but pictures of most of the unique species of the islands from mosses, millipedes and marine critters to flowers, frogs, snakes and birds. Again, printing these in poster-sized collages seemed like a perfect way to inform the citizens of the uniqueness of their islands. The majority of the images in the posters were taken by the two professional photographers who accompanied us. Dong Lin (GG I, II) photographing the Principe puddlefrog, in Santo Antonio. RCD phot. 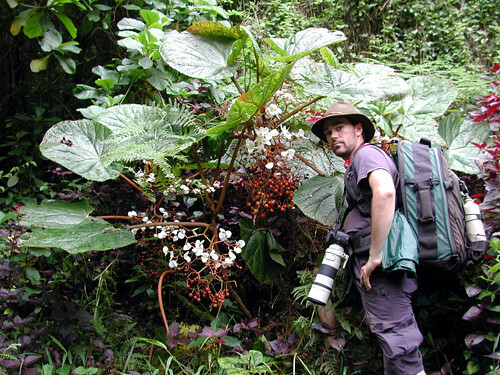 GG I.
Wesley Eckerman (GG III) among giant begonias, Lagoa Amelia. phot. R Wenk- GG III. Wes Eckerman is a professional photographer who lives in Santa Cruz California. Some of his beautiful imagery can be viewed on his website: http://www.weckerphoto.com/. We had no photographer on GG IV, but will be bringing another, Andrew Stanbridge, next month on GG V; his photographic website is at http://www.andrewstanbridge.com/. 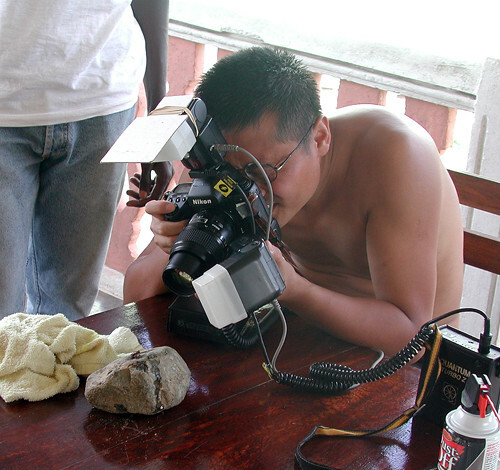 Not all of our images were by taken by the pros; a number of them were by the scientists and grad students who have been expedition members, and herein was a problem I had not forseen– various images we most needed were of different resolutions, exposures, etc! So we could not just drag them into place and have them printed. Trying to figure this stuff out (I am not an artist) in the midst of pressing academic affairs nearly drove me to distraction. Enter Velma Schnoll and Jim Boyer. Velma Schnoll, California Academy of Sciences. Velma Schnoll is a very organized, very bright woman. 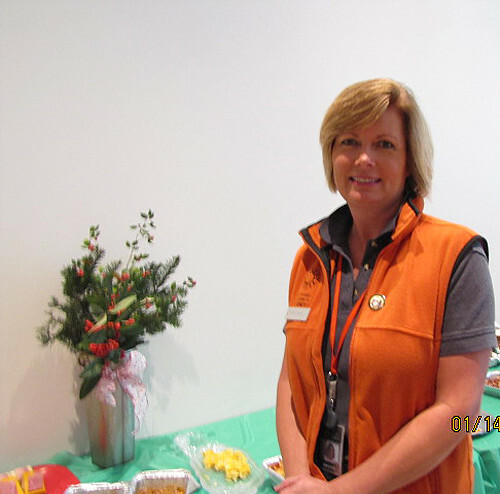 She is the Academy’s Docent Coordinator and develops all of the tours that our Docents (volunteers) lead on our public floors. Velma loved the idea of our Gulf of Guinea work and literally took over organization of the poster project from me. And she soon found Jim Boyer. 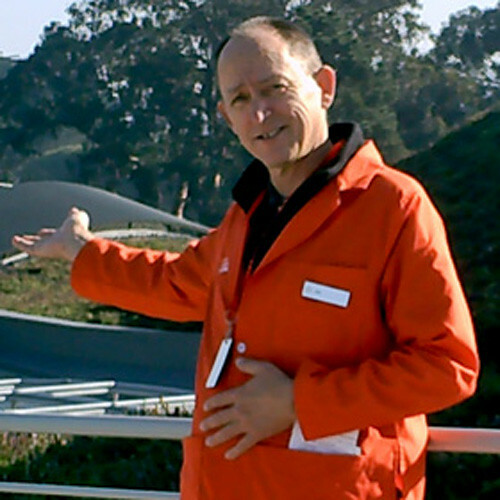 Jim Boyer, California Academy of Sciences (all docents wear orange coats). Jim Boyer, is one of Velma’s Academy docents and a retired graphic artist. Over several months the two of them organized the images and posters, making sure that we scientists proofed all of the identifications and ultimately came up with the final designs; without them, we would have no results. I had decided early to have a minimum amount of writing on the posters (except for the main message at the top) in order to let the images speak for themselves. 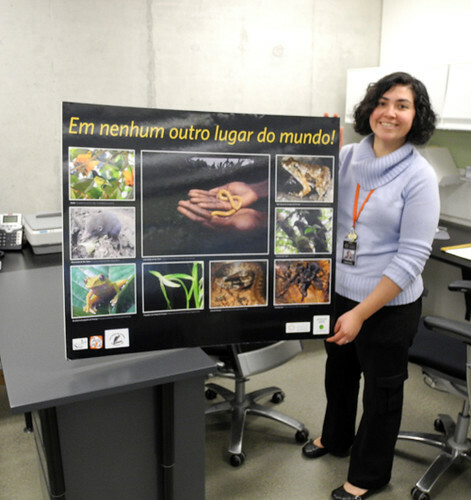 We even decided to exclude photographic credits, but it was clear that we needed to at least identify the organisms for those citizens who examined the posters closely. The scientists could provide the scientific and English names, but what about the local (Forro) or Portuguese names? For these we turned to island friends with whom we have been working for a long time and will continue to do so. The Associação dos Biologos is an active group of both formally and informally trained citizens who are concerned with their islands’ biological heritage and anxious to learn as much as they can. The group is headed by Dra. Alzira Rodriques (upper left), who is also the President of the Polytechnical Institute of São Tomé, the only institution of higher learning on the islands. 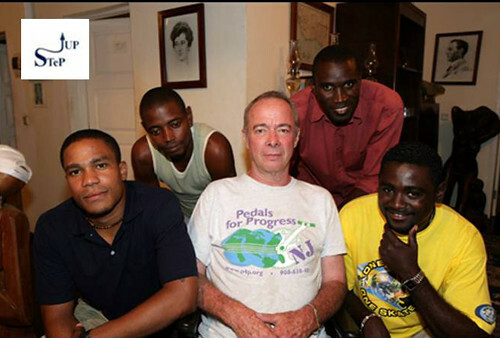 Other members include Victor Bonfim, Director of Conservation for the Ministry of the Environment (middle), Hugulay Maia (lower right), whom I introduced in the last blog, and Angus Gascoigne (upper right), one of the group’s founders. 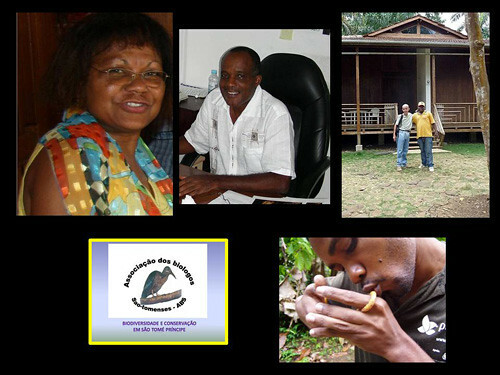 Angus has been among our most important advisors since the very beginning; he is an acknowledged expert on the land snails of the islands and is currently an instructor at the Polytechnic. 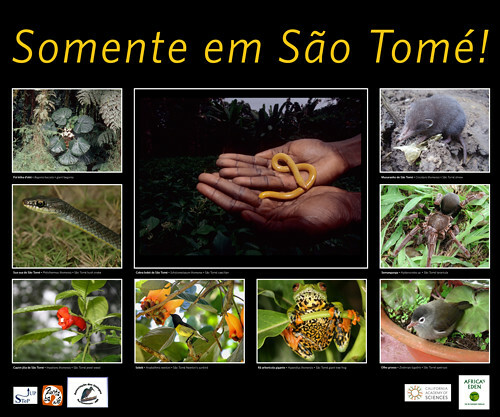 I first met Bastien Loloum at a biodiversity slide show I gave to a small group on São Tomé six years ago, and he has been a good friend and supporter of our research and educational efforts ever since. 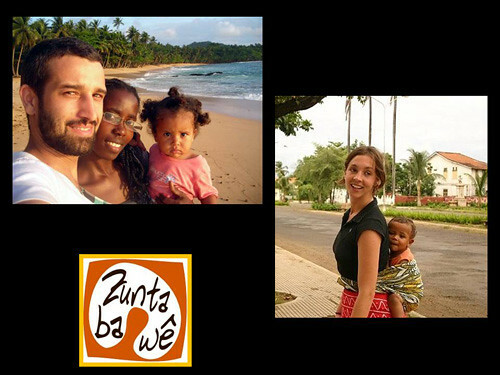 Bas is multilingual, married to Delicia Maquengo and is now General Manager of Zuntabawe, a local consulting firm specializing in ecotourism and environmental affairs. http://www.zuntabawe.net/. Mariana Carvalho (right), a PhD candidate from the University of Portugal, is Zuntabawe’s environmental advisor. Her doctoral research is on the endangered maroon pigeon, and she has already produced an enchanting biodiversity video for local schools. Both the Zuntabawe and ABS groups helped us with the vernacular names of critters, and we hope both will be involved in distribution of the posters after we arrive. Once the poster designs were completed, the remaining issue was how to get them printed. Initial queries yielded estimates far out of our price range – bear in mind that GG III, IV and the up-coming GG V have all been funded through private donations, so financial resources are always a concern! Christina Fidler, CAS library, with one of the large posters- we have 100 of this size, and 100 more of half this size. Christina Fidler, Digital Project Manager in the Academy library suggested we contact Bayphoto, a large graphic operation in Santa Cruz, California that has worked with the Academy in the past, especially on library-related imagery. The manager of the company, Larry Abitbol, graciously gave us a very large educational discount and as of last month, we now have 200 laminated posters to take over to the islands. I suspect the airlines weight charges will be substantial! Once back on the islands our primary host will, as always, be STeP Up, … This NGO, based on São Tomé, focuses on education and training in agriculture, the environment, health, and income-generation; our interaction with STeP UP has not only opened up many, many avenues of communication for us, but we as scientists have been able to broaden the environmental scope and activities of the organization itself. http://www.stepup.st/. The funding for the posters originally came as a grant from the Goldman Fund of San Francisco to STeP UP; one of our tasks on GG V will be to work with STeP UP to find a similar, effective use for the funds remaining. These particular island projects have taken on a special meaning to me personally, as has STeP UP; the opportunity to do something for a nation of people, no matter how small, is enormously attractive, and of course, the scientific discoveries we have made are exciting. But even though I had spent over three decades doing fieldwork in Africa, I probably would never have visited the islands in the first place had it not been for STeP UP. This NGO was founded and is run by exceptional people. 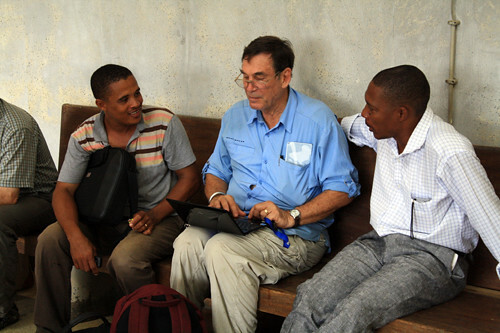 Ned Seligman is a life-long friend; our families lived a few hundred meters apart in San Francisco, and it was at Ned’s insistence that I first visited in 2000, following a wildlife conference in Libreville. Although both of us had spent our careers in Africa, this was the first time we were on the continent in the same place at the same time. Ned introduced me to the head of ECOFAC and to officials in the Ministry of the Environment, and the next year, 2001, GG I took place. Roberta dos Santos of STeP UP. 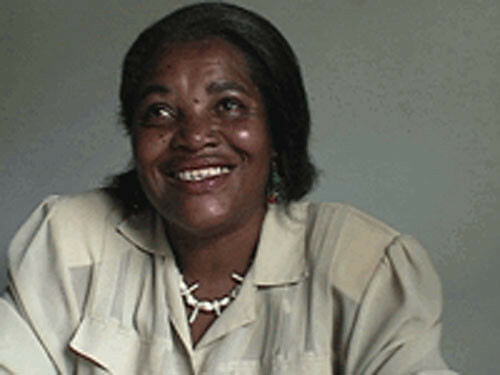 Roberta dos Santos, Ned’s counterpart, is from a venerable Sao Tomean family and knows virtually everyone on the islands. She spent three years in college in Buffalo, New York studying English (she first arrived in Buffalo in the dead of winter—she had never seen snow and probably had never been even chilly!!) and then taught for 20 years in the islands’ only high school. When Ned came to the islands as Director of the US Peace Corps, Roberta served as Assistant Director; later when Ned decided to return from directing the PC in Guinea-Bissau, they founded STeP UP. Roberta dos Santos was absolutely invaluable in introducing our own CAS Roberta Ayers (see earlier blogs) to the educational people and system on the island during GG IV, and she will be vital in getting the posters to the schools and other appropriate places during GG V. We also look forward to seeing another of the STeP UP crowd, Quintino Quade, an English teacher and our companion on so many bush adventures, from netting fish to dodging cobras. So, leve leve! If things work out, the next blog will be from the islands! A deepwater port at Neves? 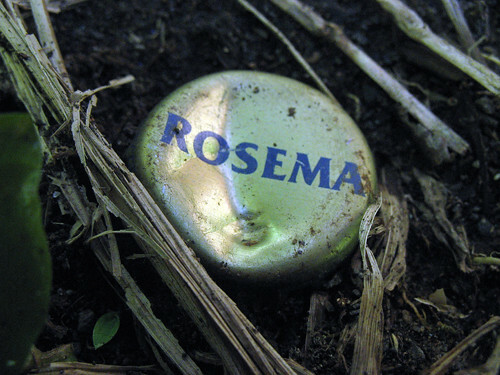 What will happen to Rosema?